The ‘Nightingale of India’, Sarojini Naidu was a dynamic woman. Be it using poetry as a means to address social issues, fighting for the recognition of women’s suffrage, or braving the colonial ‘laathi-charge’ to stand front-row in the Civil Disobedience Movement, Naidu wasn’t a woman to back down from fighting for freedom, justice and empowerment in any realm. Her contagious zeal to fight for a better world, won her the approval of many influential leaders — from The Nizam of Hyderabad, who granted her a scholarship to study overseas at 16, or Mahatma Gandhi, who considered her one of his closest, loyal and most powerful allies. On her birth anniversary today, the country raises a toast to the ‘Nightingale of India’, the woman who dedicated her life to fighting for a better India. 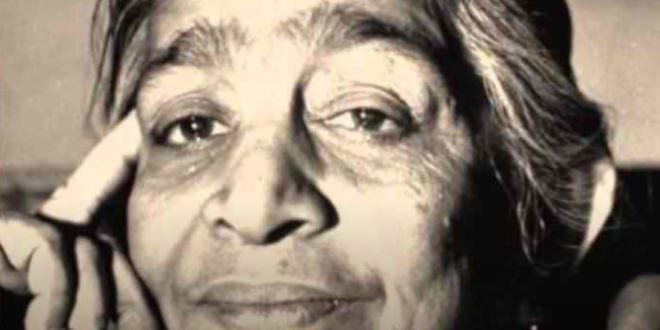 Sarojini Naidu wasn’t a woman to back down from fighting for freedom, justice and empowerment in any realm. For her infinite contributions to India’s historic struggle for freedom from the British Raj and her role in empowering the masses through her actions and words, Naidu was named the first female governor of the then United Provinces and was the first Indian woman to assume leadership as president of the Congress party. Sarojini Naidu was a celebrated poet, along with being an instrumental part of the Independence movement. Naidu was a pioneer of abstract poetry. When she was just 12 years old, she penned down a Persian poem called ‘Maher Muneer’ and showed it to her father, who was so impressed by it that he sent a copy to the Nizam of Hyderabad. The Nizam gave Naidu a scholarship to attend King’s College and later Cambridge in England. Through her time at the university, Naidu exercised her penchant for poetry religiously, but it was only when she was older and had experienced a bit more of life’s bittersweet offerings, that her poems began to surface and resonate with the masses. Some of her best poems, ‘Soul’s Prayer’, ‘Life’, ‘To India’ and ‘Indian Weavers’ explored themes of life, freedom and love through the most hard-hitting sentences. Sarojini Naidu was an instrumental part of the Indian Independence movement. When Naidu returned to India after Cambridge, the country was ripe in its fight for independence. Throwing herself into the movement, she quickly rose up in prominence as a budding leader for the masses. In his book ‘Sarojini Naidu: Her Life, Work and Poetry’, V S Naravane spoke about how back in 1905, when Lord Curzon had first announced the infamous Partition of Bengal, a young Naidu was in the front line of the protests, marching alongside personalities such as Gopalkrishna Gokhale. A few years later, reports Bipan Chandra in his book ‘India’s Struggle for Independence: 1857-1947 ’, she made the acquaintance of Mahatma Gandhi and became a follower of his quest for a non-violent, non-cooperation movement. Gandhi with Sarojini Naidu in London. When riots broke out when the Prince of Wales visited India, Naidu was the Congress representative who was asked to visit the disturbed areas and encourage the people to foster Hindu-Muslim unity. In 1924, says Chandra, Naidu visited South Africa and presided at a session of the East African Congress to criticise the Anti-Historic Bill. In 1925, she was named the President of the Congress. In 1930, when Gandhi launched the Civil Disobedience Movement with the Dandi March, Naidu was at the front-end, leading the masses as usual. Later, when Gandhi was arrested, she helped take control of the movement. She was even arrested by the police in the aftermath of the movement and later, during the Quit India Movement. However, each time she was released, Naidu dove back into the centre and led from the front. Naidu was a petitioner for the empowerment of Indian women, who’s role she believed, was instrumental in the fight for independence. In 1917, reports Naravane, Naidu collaborated with Annie Besant, one of the most famous names in the Indian Independence movement and set up the ‘Women’s India Association’. This was when her fight for the recognition of women’s suffrage began, and in that year itself, she led the delegation to meet the then Secretary of State, Edwin Montagu for its enforcement. Also Read: What Won Us Independence: Gandhi’s Non-Violence Or Armed Struggle? In 1918, Naidu addressed the importance of women’s franchise in a Congress session in Bombay. In 1919, she represented the Home-Rule League Movement, which along with Besant and herself, had also gathered support from the likes of Bal Gangadhar Tilak. Naidu also travelled to England and put forth the clause for women’s suffrage, says Naravane in his book. She also travelled the length and breadth of the country extensively, as part of an awareness drive and campaign for women’s rights and education. Naidu was on a mission, to help this country and its women fight for independence, both within and outside the realm of a colonial India.